There are more and more consumer apps/websites for price comparison, with millions of users. The largest is, of course, Google Shopping, but there are many others like ShoptoList, Price Grabber, … so pricing is now an easy information for the user to find and you can be sure it matters. In fact it matters a lot. Here are 7 numbers that should make you really understand how important pricing is. At PricingBot we strongly believe that pricing should be a significant, if not, the most significant part of your E-commerce strategy. We have built great pricing related products that E-commerce owners love and we want to share with you what we think are the 7 numbers about pricing that you should know. 63 % of people are here to compare product prices. According to a recent PWC study, 63% of people visiting E-commerce websites are there to check prices whereas only 9% are looking for ideas. 3 is the number of time your competitor will change its prices per month. 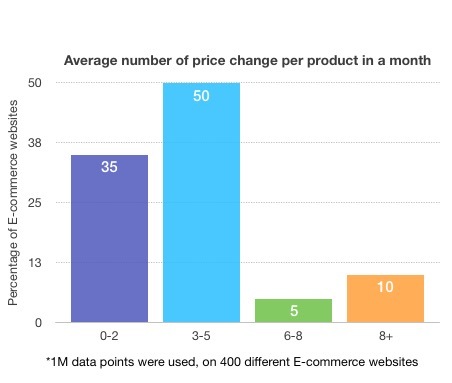 Analyzing more than 1 million data points we discovered that on average a product price change approximately four times per month. We also noticed that more than 10% of the websites we monitor change their prices almost 3 times per week (12.8 times per month), 50% of our clients change their prices with the same frequency. Those are merchants that already understands the importance of having price monitoring tools. 34% of people buying from your store matched price online just prior to the purchase. 1st criteria when deciding where to buy is pricing. It can take up to 120 hours a month to efficiently monitor 300 products. Price-monitoring takes time, we calculated that checking prices can take up to 40 hours for small size e-commerce with 100 SKUs and two competitors for each of their products. This is why we developed a solution that allows you to automatically track all your competitor’s product prices while only spending 2 minutes setting up your account. 20% of people leave checkout because they found the product cheaper elsewhere.